Appearing as tiny, roundish white specks amid the other components, perlite in potting soil is a non-organic additive used to aerate the media. Vermiculite is also a soil additive utilized for aeration (though less so than perlite), but the two are not always interchangeable, although as rooting mediums, both provide the same benefit. Other uses of perlite include masonry construction, cement, and gypsum plasters and loose-fill insulation. Perlite is also used in pharmaceuticals and municipal swimming pool water filtration as well as an abrasive in polishes, cleansers, and soaps. Perlite is a form of volcanic glass (SiO2) that is mined all over the world. Perlite is an amorphous volcanic glass that has a relatively high water content, typically formed by the hydration of obsidian. It occurs naturally and has the unusual property of greatly expanding when heated sufficiently. It is an industrial mineral and a commercial product useful for its low density after processing. Perlite is mined using open pit methods such as ripping or blasting, or both. If the perlite is soft and friable, brecciated or extensively jointed, ripping is employed with significant cost savings. Blasting is required where perlite cannot be readily broken using rippers, but care must be taken to achieve fragmentation without production of excessive fines or oversized material. While both perlite and vermiculite aid in water retention, perlite is the more porous and tends to allow water to drain much more readily than vermiculite. As such, it is a more suitable addition to soils utilized with plants that do not require very moist media, such as cactus soils, or for plants which generally thrive in well-draining soil. Horticultural perlite is made by exposing perlite to heat, which causes the trace water contained in the perlite to expand, "popping" the perlite like popcorn and expanding it to 13 times its former size, resulting in an incredibly lightweight material. In fact, the end product weighs only 5 to 8 pounds per cubic foot. The superheated perlite is comprised of tiny air compartments. Under a microscope, perlite is revealed as being covered with many tiny cells that absorb moisture on the exterior of the particle, not inside, which makes it particularly useful in facilitating moisture to plant roots. The result is a very lightweight, white stone-like substance. Perlite is prized for its moisture retention and aeration properties. It is naturally sterile and has a neutral pH. 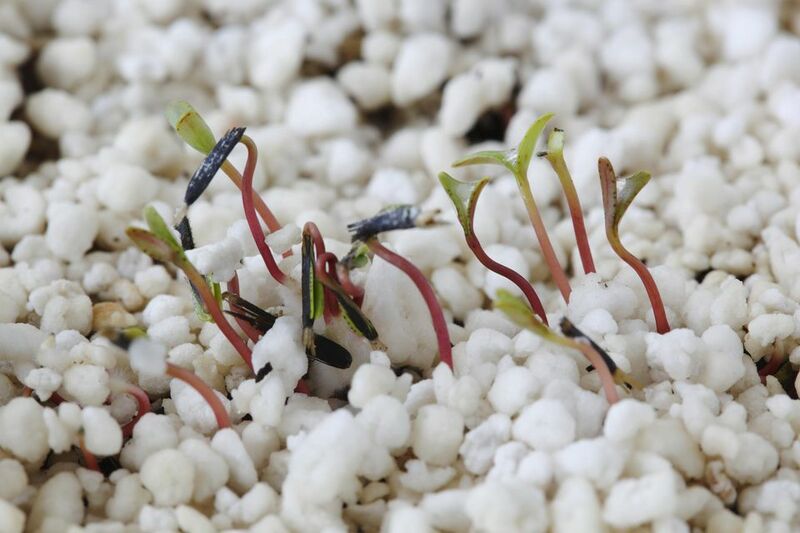 Horticultural perlite is used as a component in soilless growing mixes, a growing medium for rooting cuttings, or as a hydroponic growing media. When growing plants in perlite, be aware that it may cause fluoride burn, which appears as brown tips on houseplants. Perlite is considered a "nuisance dust" by regulatory agencies, which means that efforts should be made to control perlite dust. Eye and mouth protection are recommended to prevent the dust from being ingested. Perlite dust can aggravate existing respiratory conditions and cause eye irritation. Perlite does not cause cancer, although some commercial perlite products may also contain a very small amount of quartz, which is listed as a carcinogenic substance.